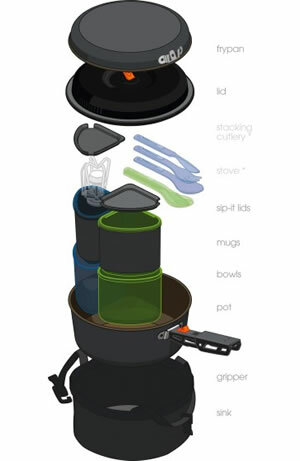 The Pinnacle Backpacker Cookset is a lightweight mess kit designed to accommodate two people. The set includes an attractive 2-liter aluminum pot and 8″ frypan, a plastic strainer lid, two 14 fluid-ounce insulated mugs, two 14 fluid-ounce bowls, two Sip-It lids, a folding pot gripper and a rubberized welded sink designed to protect the kit when it’s not in use. The entire kit is 5.40″ tall, 8.20″ in diameter and weighs a total of 28.8 ounces including the rubberized sink. The outside of the aluminum pot and frypan is protected by a hard-anodized non-reactive coating that is fully formed before anodizing for an attractive garnet-hard finish with exceptional heat dispersion and scratch resistance, common to most cookware in GSI Outdoors’ Pinnacle series. The base of the pot and pan are also spiral turned to grip stove tops and grills securely. Lining the inside of the pot and frypan is an incredibly durable three-layer Teflon-based protective coating engineered by DuPont that is called Teflon with Radiance technology. It is a specially-formulated coating that provides the Pinnacle Backpacker and other cookware in the Pinnacle line with exceptional non-stick performance, even heat distribution and superior scratch and abrasion resistance that is even safe for use with most metal utensils. The cookset includes a rugged heat-resistant nylon lid with a silicone seal wrapped around the perimeter with an integrated strainer located on one side and a small air hole on the other. While the lid is heat resistant, it is not flame resistant and should not be used while the pot or pan is sitting over a flame. Additionally. there is a small orange flip-up tab to safely handle the lid. 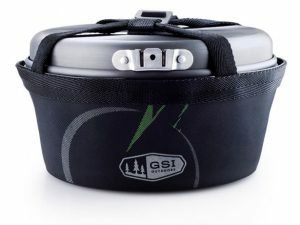 GSI Outdoors’ Pinnacle Backpacker Cookset also features two color-coded 14 fluid ounce bowls and two color-coded 14 fluid ounce mugs with EVA foam insulating sleeves and sip-it lids. The Pinnacle Backpacker is capable of holding as many as four complete nFORM Crossover sets total. Additional sets can be purchased separately on Amazon. The bowls and mugs are made from an ultralight BPA-free semi-transparent polypropylene called Infinity which is essentially a polycarbonate resin alternative resistant to heat, odors, and deformation. Infinity is buoyant, stain-resistant and will not leach plasticizers or other chemicals into your food or beverage. For added convenience, there are marked graduations inside the bowls and mugs so they can also be used as measuring cups. Keeping the cookset together, there is a rugged nylon stuff sack with welded seams and a secure handle. The inside of the sack is laminated with a rubberized coating creating a small water-tight storage basin perfect for tasks like transporting water, water storage, washing dishes and personal hygiene. The design philosophy behind GSI Outdoors’ Pinnacle series and many of their other products is their nFORM Ultralight System. Ultralight backpacking does not always have to mean making sacrifices. In basic terms, nFORM is a comprehensive “nesting” solution for fitting the maximum amount of gear possible into the smallest amount of space as possible. To protect the finish from that nasty carbon residue that gets left behind after a wood fire and the sticky gunk from tablet-based fuels, simply coat the outside of the cookware with a light film of soap just prior to use. Once you are done using the pot or pan, the bulk of the residue will rinse away with a little water. Testing out a set of cookware would obviously not be as extensive as testing a knife, water filter or a pair of boots, but I feel it is important to document the experience and demonstrate how well it actually works whenever you can. While taking the pot out for a spin, I boiled up about 6 cups of water to rehydrate some dehydrated hash browns. 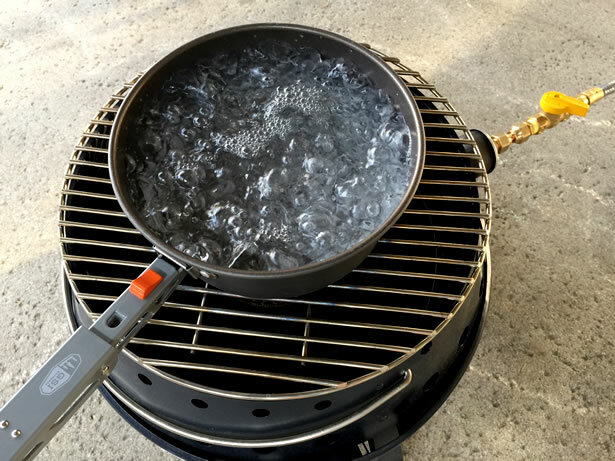 I set it atop a Volcano Stove hooked up to natural gas and proceeded to boil the water. The circular rings on the bottom of the pot work very well at preventing the pot from sliding around on the grilltop. As the pot warmed, I noticed how evenly it heats around the bottom of the pot. Just over 4 minutes later, the water had reached a rolling boil so I quickly shut off the flame and added in an equal amount of hash browns. I let it sit for about 15 minutes, stirring occasionally before straining any remaining water off and lightly rinsing them. The last step was to cook them in a well-oiled pan until browned. They were delicious! To further test the cookware, I used the cookset to reconstitute a freeze dried soup meal. Once the water reached a boil, I poured in the entire contents of one of the meal kits and found that a 5-serving meal and the necessary water to reconstitute it fits perfectly in the pot. After simmering for about 20 minutes, the potato soup I had made was ready so I served it using the two serving bowls. Even though the soup was hot, the heat did not radiate through the bowl excessively. After each use, I thoroughly cleaned the cookset. Everything came clean without much effort… Just a little soap and water is all it took, mostly due to the great nonstick surface. Once dried, I did not notice scratches on any of the surfaces inside and out. GSI Outdoors’ Pinnacle Backpacker Cookset is a complete cooking solution that includes almost everything you’ll need to support a small group of two or more. 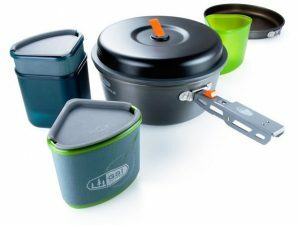 The fit and finish is rather sharp-looking, and the cookset is extremely lightweight and durable, though it might be a little much for long excursions where minimalism is better suited. With the kit packed neatly inside, there is plenty of room for a small stove, fuel canister and other necessities that you need to bring along. If you are looking for lightweight cookware for two or more people that will hold up to the abuse and last a long time, the Pinnacle Backpacker Cookset is as good as they come. It is perfect for family campouts, tailgating and short excursions into the wild.